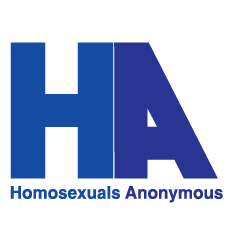 Homosexuals Anonymous - Local Chapters and H.A.F.S. What is a local H.A. chapter’s relationship to Homosexuals Anonymous Fellowship Services? The H.A.F.S. Board is a group of dedicated men and women who provide guidance on how the message can best be proclaimed that there is hope and help in Christ for the person in conflict with his or her homosexuality. Local Chapter Contributions to H.A.F.S. H.A.F.S. suggests that at least 10% of your weekly collections be sent to H.A.F.S. on a monthly or quarterly basis. The remainder is used for 1) rent of the meeting room, 2) refreshments, 3) literature, and 4) any other expenses encountered (advertising costs, telephone bill, etc.). No large funds should accumulate at the local chapter level. This prevents being sidetracked by financial interests and precludes misuse of financial influence. From local chapter contributions, H.A.F.S. is able to provide all chapters with supportive services which include consultation and printed materials. Annual statements will be provided to local H.A. chapters upon request. Contributions sent to H.A.F.S. will be acknowledged and are tax deductible. No H.A. chapter should own real estate.